A-1000-5U Automatic is designed for the production of pet - bottles. Bottles made from this equipment has a capacity from 3.0 to 6.0. 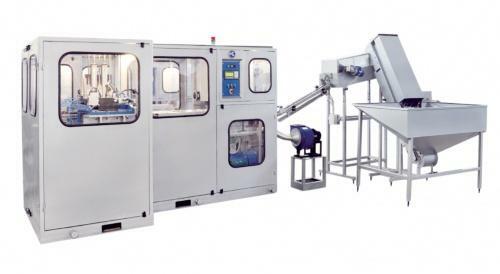 The autoloader is designed to guide the production by feeding them into the heating zone. The furnace used for heating the production is intended for uniform heating and orienting the heated production by stepping in the area of ​​capture-arm carriage. The power plant is designed to skid heat during production into a mold by blowing the products; to remove finished products from the molds; and for further submission to the next element of the production line. The machine is equipped with pneumatic equipment from leading firms "FESTO", "AirCom", and "OMRON”.